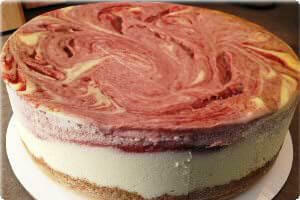 This Strawberry Swirl Cheesecake has fresh strawberry puree that is swirled onto a creamy white cheesecake that rests on a thick buttery vanilla wafers cookie crust. It is a delicious, smooth and gorgeous cheesecake that is made with farm fresh dairy products and cream cheese. It is a 9-inch cheesecake that serves 8-10. The Strawberry Swirl Cheesecake is handmade, freshly baked specifically for your order and will ship 2 business days after your order is placed. It will be shipped directly from the baker in its own thickly insulated shipping box, packed with dry ice, and will incur a separate shipping charge.